And it’s with those thoughts in mind that I want to let you know about a recent connection — it’s to a great organisation called Buy1GIVE1 (or B1G1: Business for Good as most people call it these days). Let me explain why it’s so important to me. For ever, I’ve believed we all have the opportunity to do great things and make a difference when we’re doing them. Yet when you run a business, it’s challenging to do that. All sorts of difficulties come up when you think ‘traditionally’; thoughts like ‘I have to be a big business to give so I’ll wait until I’m successful’, or thoughts like, ‘how can I be sure to select seriously great causes’, or even, ‘how do I really know where my money is going.’ You’ve probably had similar thoughts. 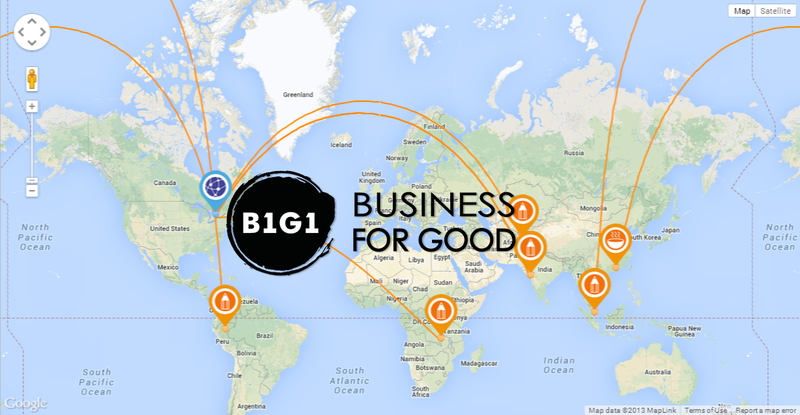 B1G1: Business for Good just ‘nails’ so many, many things for me; things I never imagined could be possible. For example, I can give just 1 cent (seriously) and it makes a huge impact in B1G1 — no longer do I have to wait until I’m ‘successful’, it can be a part of my business NOW. Better still, I can select from nearly 800 high-impact, fully checked-out trusted, close to the ground (i.e. no high buildings housing masses of executives) projects around the world. And how about this, fully 100% (yes, every cent) of my giving goes to the projects I select. Oh yes, I can chop and change projects in a heartbeat too. So it means I can give back in a way that resonates with my clients as well. And the biggest thing of all? Every time we do something here now, something great happens. And that is real meaning and purpose. It’s really belonging. It’s really being connected to something great. Maybe you’d like to check it out too — I think you’ll love what you discover at www.b1g1.com. Love it …. and thank you for your generosity and graciousness, Jen.